In the second quarter of 2018, 21% of Canadian cannabis consumers spent over $250 on cannabis in a three-month period, according to a Statistics Canada report. 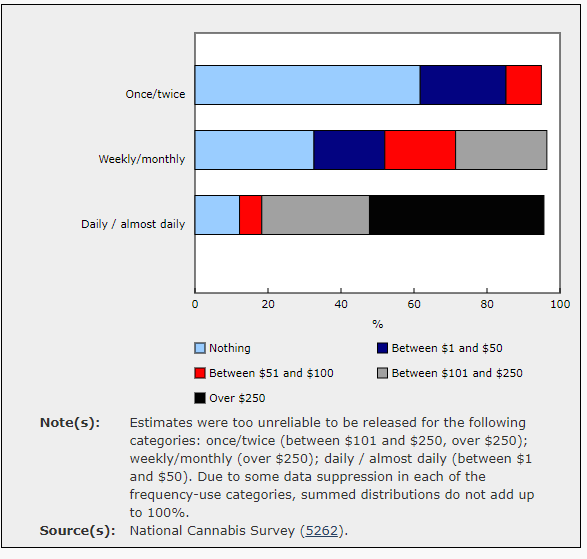 One-third of cannabis users reported spending nothing on the cannabis consumed, while another 25% spent up to $100, and 21% spent up to $250, numbers that remained consistent with first quarter reports. As expected, higher spending was associated with more frequent use with nearly half of daily or almost daily users reported spending in excess of $250, and another 30% reported spending between $100 and $250. In the past three months, about 4.6 million people nationally, or close to 16% of Canadians aged 15 years or older consumed cannabis, similar to first quarter results. According to the report, second-quarter reported usage was unchanged at the national level, but a few changes may be occurring by region. For example, the percentages that reported using cannabis appeared to rise between quarters in Ontario, and to fall in Saskatchewan, although data collection will continue to help understand these trends. Nova Scotia and Ontario reported the highest rates of cannabis use, at 21% and 18% respectively, which is above the estimates for the rest of Canada. Whitehorse (23%), Yellowknife (27%) and Iqaluit (33%) all had percentages higher than the national average, while Quebec (11%) and Saskatchewan (10%) reported lower rates of cannabis use. Males had higher reports of cannabis use at 19%, while females reported 12%. 15 to 25 years had a consumption rate of 33%, nearly two-and-a-half times the rate for those aged 25 or older (13%). The report suggests that increased rates of use in youth may be in part responsible for geographic variation in regions that have a higher concentration of youth, such as the territorial capitals. Among current cannabis consumers, 28% indicated that they would be likely to increase their use after legalization, compared to 6% of Canadians not currently using. Overall, more than 8 out of 10 (82%) said they would be unlikely to try cannabis or to increase their consumption with legalization, which is relatively consistent with first-quarter results (79%). However, these results differed dramatically between current and non-consumers.